The first day of Spring JUST finished, and it’s already happening. People are obsessing over Easter. They’re breaking out their easter egg, rabbit, and chick-themed bento supplies and preparing to make 6 meals, 4 snacks, and 14 crafts, all Easter-themed, over the weekend. They’re making sparkly rabbit footprints all over the yard once their kids are in bed Saturday night, to prove the existence of the Easter Bunny. What if, instead, we all just…chill… out? Easter was fun for me when I was a kid. I remember the baskets full of treats, sure, but also the easter egg hunts in our backyard. Just my sisters and myself. Nothing insane. But my dad would hide a lot of the eggs in actually tricky spots, and some had money inside! The stakes were high. We dyed eggs, made our traditional Italian Easter Pie, and wore pretty dresses. We played. We looked for eggs, sometimes for hours. And we relaxed. Easter wasn’t a high-stress holiday full of obligations, visits, and events. It was straight-up fun. That’s what I aim for as a parent, now, with my kids. Make our traditional Italian Easter Pie (probably Saturday), and eat some for breakfast on Sunday. Make Easter baskets for the kids, using baskets we already have. Fill with some plastic easter eggs with snacks (dried fruit, hunks of cheese, and nuts were a big hit last year). Throw in some warm-weather consumables I was going to buy for the kids anyway, like sidewalk chalk and bubbles. Fill some more plastic eggs with pennies, stickers, or additional snacks, and hide them around our back yard. Let my 2 kids have fun finding them. 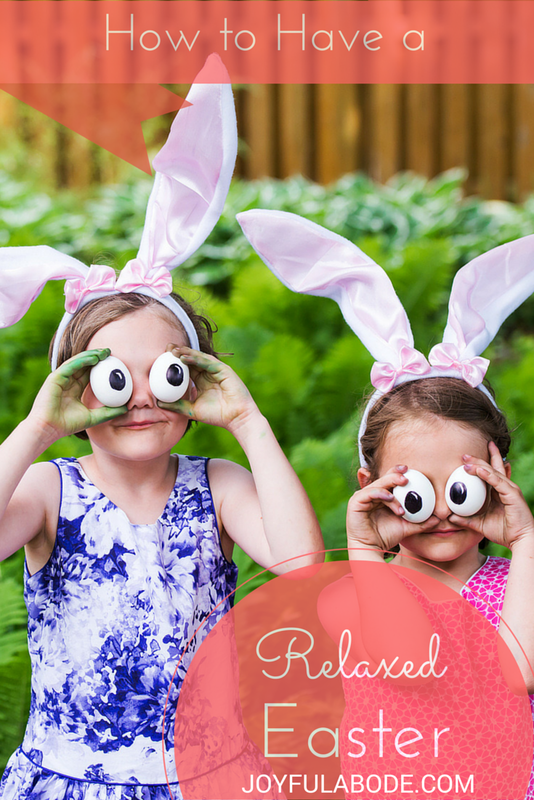 Do you have plans for a fun, relaxed, stress-free Easter?